Emeralds are known to be some of the most seductive gemstones out there , the ideal match for those daring spirits and sharp minds. Diamond Essence Emerald jewelry collection offers beautiful stud earrings , delicate pendants , impressive bracelets and gorgeous earrings that will make any loved one shine in the eye of the beholder. Diamond Essence 0.5 carat each, emerald stone set in 14K Gold Vermeil tubular bezel setting. 1.0 ct.t.w. Choice of 2 and 4 ct.t.w. available. Diamond Essence 0.5 carat each, emerald stone set in Platinum Plated Sterling Silver tubular bezel setting. 1.0 ct.t.w. Choice of 2 and 4 ct.t.w. available. Delicate Floral Studs. 0.10 carat Emerald Essence surrounded by Diamond Essence melee. 0.75 cts.t.w in Platinum Plated Sterling Silver. Diamond Essence studs. Specify your choice of Diamond Essence Ruby, Emerald, or Sapphire. 2.0 Cts T.w. in Gold Vermeil. A brilliant-cut Diamond Essence pendant. 1.0 cts. t.w. stone in Gold Vermeil. Specify your choice of Diamond Essence Canary, Emerald, Pink, Lavender, Champagne, Sapphire, or Ruby. A brilliant-cut Diamond Essence pendant. 1.0 cts. t.w. stone in Platinum Plated Sterling Silver. Specify your choice of Diamond Essence Canary, Emerald, Pink, Lavender, Champagne, Sapphire, or Ruby. Approx Size Of Pendant Is 11.5 mm Length And 6.5 mm Width. Free Silver Chain Included. Platinum Plated on Sterling Silver Diamond Essence studs. Specify your choice of Diamond Essence Sapphire, Ruby or Emerald. 2.0 cts. t.w. Designer Pendant With Emerald Essence Asscher cut stone in four prongs setting and surrounded by Diamond Essence Melee,1.50 Cts.T.W. in Platinum Plated Sterling Silver. FOR MATCHING EARRINGS ITEM# SEC3048E. Approx Size Of Pendant is 10.5mm width and 16mm Length. 14K Gold Vermeil Emerald cut Emerald Essence 2 Cts. Each Studs Set Four Prong Setting, 4 Cts.T.W. For Sapphire Essence 14K Gold Vermeil Earrings Item # VED5345S. A brilliant-cut Diamond Essence pendant in Gold Vermeil. Specify your choice of Diamond Essence Canary, Emerald, Pink, Lavender, Champagne, Sapphire, or Ruby with 2.0 cts. t.w. stone. A brilliant-cut Diamond Essence pendant. 2.0 cts. t.w. stone in Platinum Plated Sterling Silver. Specify your choice of Diamond Essence Canary, Emerald, Pink, Lavender, Champagne, Sapphire, or Ruby. A brilliant-cut Diamond Essence pendant. 1.0 cts. t.w. stone in 14K Solid Gold. Specify your choice of Diamond Essence Canary, Emerald, Pink, Lavender, Champagne, Sapphire, or Ruby. Approx size of Pendant is 11.5 mm Length and 6.5 mm Width. Platinum Plated Sterling Silver Emerald cut Emerald Essence 2 Cts. Each Studs Set Four Prong Setting, 4 Cts.T.W. For Sapphire Platinum Plated Sterling Silver Earrings Item # SED5345S. V-shaped rings of Emerald Diamond Essence jewels are beautiful on their own, or stack several to wear as a set. 1.0 ct. t.w. each. in 14K Gold Vermeil. Emerald Essence Heart Pendant - 0.5 Cts. T.W. set in 14K Gold Vermeil. Approx Size Of The Pendant is 20 mm Length And 16 mm Width. Designer Stud Earrings. One carat Emerald Essence Asscher cut stone in four prongs setting and surrounded by Diamond Essence melee. 3.0 cts.t.w. in Platinum Plated Sterling Silver. FOR MATCHING EARRINGS ITEM# SPC3048E. Approx Size Of Pendant is 9mm width and 9mm Length. 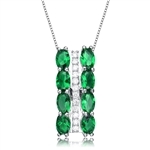 Diamond Essence Sterling Silver Pendant with 1.50carat Round Brilliant Emerald Essence stone surrounded by Diamond Essence melee, 2.0 cts.t.w. set in Platinum Plated Sterling Silver. Just perfect for everyday wear. Approx Size Of pendant Is 17 mm Length And 10 mm Width. Diamond Essence Pendant With Emerald Cut Emerald Essence Stone And Round Brilliant Melee, 1.75 Cts.T.W. In Platinum Plated Sterling Silver. Approx Size of Pendant 18mm Length And 6mm Width. Gold Vermeil three stone Ring with 2.0 cts Emerald Essence center stone and 1 carat Diamond Essence round brilliant on each side. 4.0 cts.t.w. Simple but elegant, this Platinum Plated Sterling Silver ring with Diamond Essence round brilliant stones and emerald stones 1.2 cts.t.w. V-shaped rings of Emerald Diamond Essence jewels are beautiful on their own, or stack several to wear as a set. 1.0 ct. t.w. each. in Platinum Plated Sterling Silver. 14K Gold Vermeil Stunning Three Stone Ring with 1 Ct Oval Cut Emerald Essence Center and Diamond Essence Triangle on Each Side, 2 Cts.T.W. A brilliant-cut Diamond Essence stone pendant. Specify your choice of Diamond Essence Canary, Emerald, Pink, Lavender, Champagne, Sapphire, or Ruby. 3.0 cts. t.w. set in 14K Gold Vermeil. Emerald Essence Heart Pendant - 0.5 Cts. T.W. set in Platinum Plated Sterling Silver. Approx Size Of The Pendant Is 21mm Length And 9mm width. Diamond Essence Solitaire Ring With Emerald Round Brilliant stone, 2 Cts.T.W. In 14K Gold Vermeil. Diamond Essence Designer Pendant, with Emerald color Oval cut stones set in prong settings and Round Brilliant melee in a bar setting, 2.10 cts.t.w. in Platinum Plated Sterling Silver. (Matching earring SEC2517E). 7 inches long Tennis Bracelet with Princess cut Diamond Essence and Emerald essence stones , each stone of 0.20 ct. set in alternate group of 5 stones. 10.4 cts.t.w. in Platinum Plated Sterling Silver. Platinum Plated Sterling Silver, Three stone ring. Diamond Essence 2.0 carat round brilliant emerald stone in the center and 1.0 carat round brilliant stones on each side. 4.0 cts.t.w. A brilliant-cut Diamond Essence pendant. 2.0 cts. t.w. stone in 14K Solid Gold. Specify your choice of Diamond Essence Canary, Emerald, Pink, Lavender, Champagne, Sapphire, or Ruby. A brilliant-cut Diamond Essence pendant. 1.0 cts. t.w. stone in 14K Solid White Gold. Specify your choice of Diamond Essence Canary, Emerald, Pink, Lavender, Champagne, Sapphire, or Ruby. A brilliant-cut Diamond Essence pendant. 3.0 cts. t.w. stone in Platinum Plated Sterling Silver. Specify your choice of Diamond Essence Canary, Emerald, Pink, Lavender, Champagne, Sapphire, or Ruby. Platinum Plated Over Sterling Silver Stunning Three Stone Ring with 1 Ct Oval Cut Emerald Essence Center and Diamond Essence Triangle on Each Side, 2 Cts.T.W. Diamond Essence Platinum Plated Sterling Silver Stud Earrings 0.50 Ct. Each, with Emerald Essence set in Jackets, 2.60 Cts.T.W. For Sapphire Essence : SEC167JS. Diamond Essence Solitaire Ring With Emerald Round Brilliant stone, 2 Cts.T.W. In Platinum Plated Sterling Silver. 7 inches long Tennis Bracelet with Princess cut Diamond Essence and Emerald Essence stones, each stone of 0.20 ct. in alternate setting in Platinum Plated Sterling Silver. 10.4 cts.t.w. 7 inches long Tennis Bracelet with Round Brilliant Diamond Essence and Emerald Essence stones, 0.10 ct. each, set alternate in Platinum Plated Sterling Silver, 5.10 cts.t.w. The Emerald is a stone characterized by a truly feminine spirit full of nurturing qualities. It is said to be the stone of loyalty, faithfulness and friendship. Wearers of Emerald can benefit from the metaphysical properties of improved memory and enhanced mental capabilities. Traditionally associated with the attributes of fertility, love and rebirth, the Emerald was dedicated by the Ancient Romans to Venus, the goddess of love and beauty. The striking magnificent lush shade was one of Cleopatra’s favorite gems. Today, emerald represents wisdom, growth and patience. Diamond Essence is proud to offer an impressive collection of Emerald jewelry. Choose a stunning floral bracelet ,a beautiful Emerald tennis bracelet, spectacular solitairs or a pair of "drop dead gorgeous" earrings and you'll be a true fashionista. Each emerals stone is perfectly set in exquisite metal desig and you can choose from gold, silver, vermeil gold and platinum plated since we cater a large variety of cost options.